Record numbers of sea lions are gathering in the Lower Columbia river this spring, intensifying the long-running challenge to protect salmon runs. 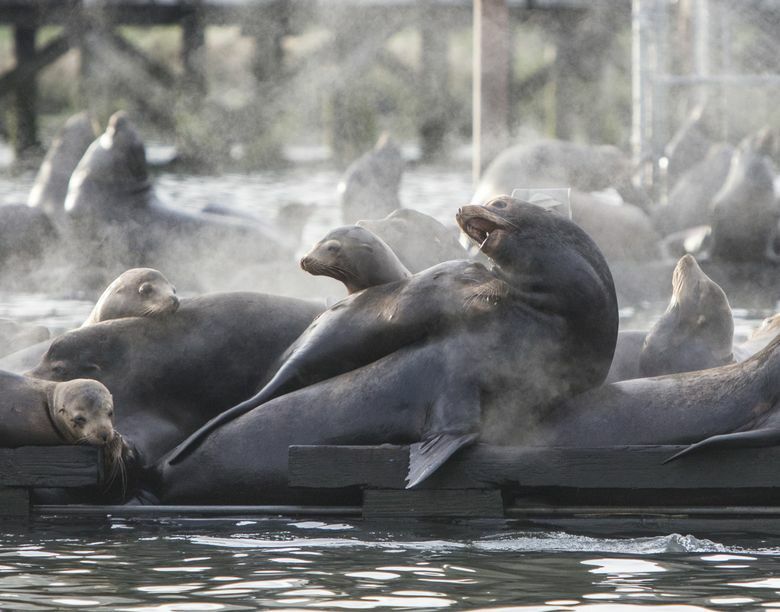 Astoria, Oregon — In a marina near the mouth of the Columbia River, the boats are far outnumbered by the masses of California sea lions that are congregating here this spring in record numbers. 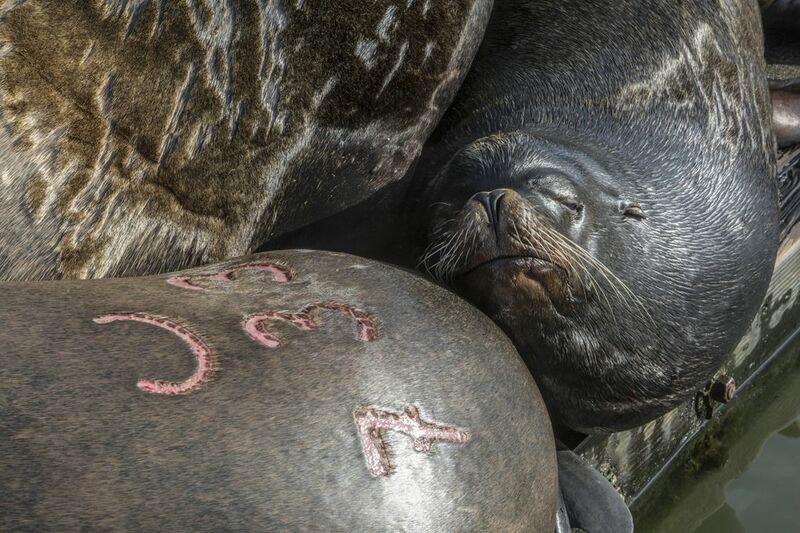 Two long floating docks are covered with a carpet of bewhiskered sea lions that wedge tight against one another, heads resting on the ample rumps of their neighbors. These are males, drawn to the Columbia by smelt, a favorite food in ample supply. Earlier this month, a survey counted 2,340 sea lions on the East Mooring Basin docks and nearby jetties — more than 10 times the peak number tallied four years earlier. In the weeks ahead, as the smelt run wanes, the sea lions will turn their attention to prized spring chinook. Their expanding presence in the river is escalating the challenges — and the conflicts — for biologists working to protect wild-salmon run. They also must manage sport and commercial fishing, where the savvy marine mammals are adept at grabbing dinner off an angler’s line or tearing through a commercial gillnet. The California sea lions’ boom times on the Columbia are part of a remarkable recovery for a West Coast species once hunted for pet food and pelts almost to extinction. Since the 1950s, their population has rebounded from fewer than 20,000 to more than 300,000. With their numbers at what scientists believe are historical highs, any downturn in food supplies within the sea lions’ range can be trouble. 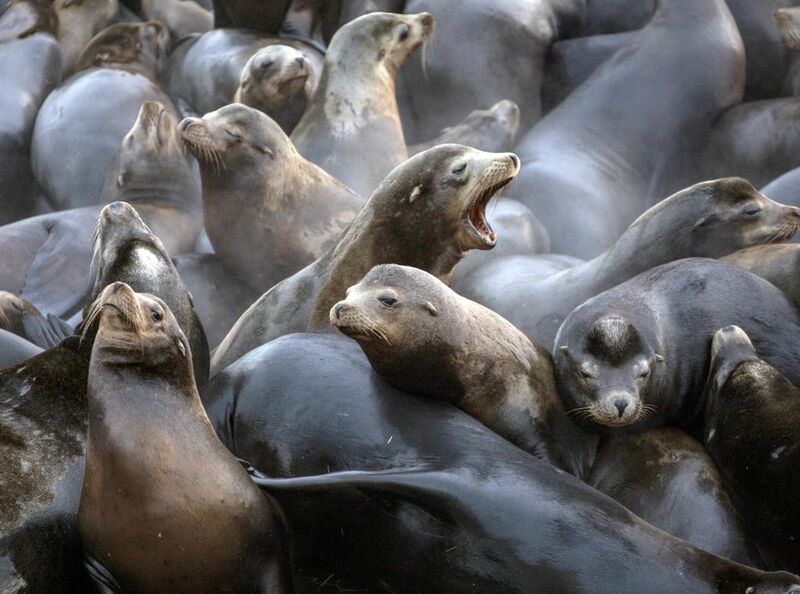 This year, while the male sea lions gorge in the Columbia, a starkly different scene of scarcity is unfolding in the sea lions’ home territory in California. In recent months, more than 2,000 malnourished pups and yearlings have washed up on the beaches, spurring major efforts to rescue and, when possible, revive and release them. Most of these sea lions are born in the Channel Island rookeries offshore of Los Angeles. But near-record warm sea surface temperatures appear to be making it more difficult for females to find enough prey to nourish their young, which then wean early and try to survive on their own. The 2015 strandings on California beaches are on track to reach record levels, and could be a forerunner of a more volatile future for sea lions in a 21st century primed for climate change and more warming. These brandings, which began in 1997, are annual events that have helped biologists to track the movement of the sea lions within the Columbia River and along the West Coast. In the early years, only a few sea lions showed up in Astoria, so the trap, a small floating dock surrounded by a metal cage, was often empty. This year, the trap is often jammed with dozens of sea lions, so many that some animals need to be let out before the gate is closed. While some of the younger males may have come up from California, many of the larger males arrive in Astoria after spending months foraging farther north in Puget Sound, British Columbia and southeast Alaska. By the time they reach Astoria in the winter, the older males are on a final push to fatten before heading back to the Channel Islands in April or May for the summer mating season. Researchers say there is no archaeological evidence of the California sea lions frequenting the Columbia in centuries past. But in recent decades it has become a regular stopover point. Their numbers have risen as smelt runs have grown stronger. Once in the river, the sea lions can make spectacular weight gains. During a four-month stay in the Columbia, one male sea lion trapped several times by biologists had added nearly 400 blubbery pounds. “He looked like a blimp,” said Robin Brown, a marine- mammal biologist with the Oregon Department of Fish and Wildlife. Federal, Oregon and Washington biologists have been most concerned about a smaller contingent of Columbia River males — typically less than 10 percent of the total in Astoria — that make it more than 135 miles upstream to forage at the base of the Bonneville Dam. The dam is a sensitive spot where salmon, including endangered wild runs, stay before moving through the fish ladders. Since 2008, biologists have euthanized 55 of these sea lions under an authorization granted Washington and Oregon by NOAA Fisheries, which administers the Marine Mammal Protection Act. Another five have been accidentally killed. “We’ve been able to reduce the number of sea lions at Bonneville Dam effectively with this program,” said Brown, the Oregon state biologist. This year, NOAA will continue to help pay for lethal removals of sea lions below Bonneville, even as the agency funds the rescue of sea lions dying on California beaches. Male California sea lions, known for their marathon bouts of fighting and mating, also like to just be pals. In the Channel Island rookeries where most California sea lions breed, the biggest and strongest males stake out turf. They may go through a weekslong marathon of fighting and mating, and lose hundreds of pounds, before finally heading back out to sea to eat. But not all breeding males clash at the rookeries, and some appear to form enduring bonds, according to marine mammal biologists. Biologists observed two males, year after year, peacefully coexisting on adjacent stretches of a rookery beach during the summer mating season. During the winter, they also repeatedly spotted the same two males, side by side, among the vast number hundreds of sea lions that haul out on Astoria docks. One of the pair is now dead. This year his gargantuan buddy, branded C631, was spotted in a new Astoria location underneath a pier that supports a popular brew pub. Outside of the breeding season, the males also appear to enjoy being part of a broader pack. A tracking study found that sea lions foraging below Bonneville Dam would travel all the way back to Astoria — a distance of more than 135 miles milles— for a few days of rest on city docks crowded with their brethren. Then they would head back up stream to eat. “Clearly, there is a lot of sociality going on with these animals,” said Bob DeLong, a NOAA Fisheries biologist. NOAA officials say the disparate actions reflect their dual mandates of trying to recover endangered wild-salmon runs and protect sea lions. In the Pacific Northwest, the agency’s sea-lion policy has been bitterly contested by animal-rights activists. Critics say the sea lions are paying the price for dams and other developments that have severely damaged wild-salmon runs, and have tried to block the lethal-removal program in court. After years of litigation, NOAA Fisheries prevailed in a 2013 Ninth Circuit of Appeals that ruled the killing could continue. The Sea Lion Defense Brigade watchdogs the trapping and branding in Astoria, as well as harassment tactics at Bonneville Dam that include firing rubber bullets or tossing seal bombs. They post their surveillance video online, and in a recent “Call to Action” on their Facebook page, urged people to write Oregon Gov. Kate Brown to stop branding and killing sea lions. Observations of California and Steller sea lions feeding below the Bonneville Dam indicate they consumed around 2 percent of last year’s spring salmon run. But a NOAA study, based on tagging spring chinook that are caught and released in the Lower Columbia, suggests sea lions hunting farther downriver might be taking a much bigger bite out of the run. Preliminary results of the 2014 tagging indicate that 45 percent of the upriver-bound spring chinook — even after adjustments were made for those expected to be killed by fishermen — failed to make it past Bonneville Dam. The study does not say that sea lions ate the missing salmon. But it points the finger at them as prime suspects. “I have been telling people not to get hung up on the exact numbers, but see that there are strong and consistent trends,” said Michelle Wargo-Rub, the NOAA Fisheries biologist who has headed up the study team. Frustrated fishermen also have noted increasing competition from sea lions that may respond to a waving net or excitement on a boat as their cue to grab a meal. “They are very bold. They will take a fish right beside the boat. They have no qualms about that,” said George Krumm,who fishes the Willamette, a tributary of the Columbia. As sea lions have honed their fish-snatching skills, fishermen, too, have adapted, learning to keep their nets down and stay quiet when a salmon is hooked. State biologists also are adjusting their tactics. For several years, they harassed sea lions feeding on salmon and steelhead at Willamette Falls, south of Portland. 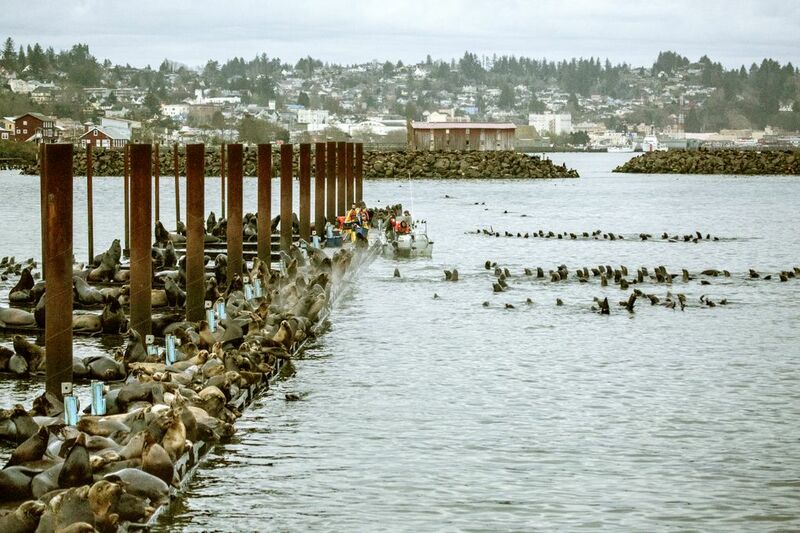 But that pushed several dozen sea lions back down the river crowded with sport-fishing boats. So Oregon biologists stopped scaring off the sea lions and hired observers to count the numbers of fish eaten by sea lions. When enough data is collected, the Oregon Fish and Wildlife Commission could request federal permission to kill some of the sea lions that frequent the falls, just as they are now able to do at Bonneville. Last year, their study found that the sea lions at the falls ate 13 percent of a wild-steelhead run listed under the Endangered Species Act and 8 percent of a spring chinook run. But the troubles that sea lions are having in California this year show how things can change. In the future, if smelt runs drop off in the Columbia River, sea- lion numbers would likely shrink as well. This year, however, the sea lions are still a formidable presence. The observers are back at their stations, spending long hours peering down from concrete overlooks as sea lions hunt the roiling water below the falls. After several hours of quiet, one sea lion finally came up with a fish. He thrashed it in his mouth, breaking it into smaller pieces before devouring the last chunk of tail. Hal Bernton: 206-464-2581 or hbernton@seattletimes.